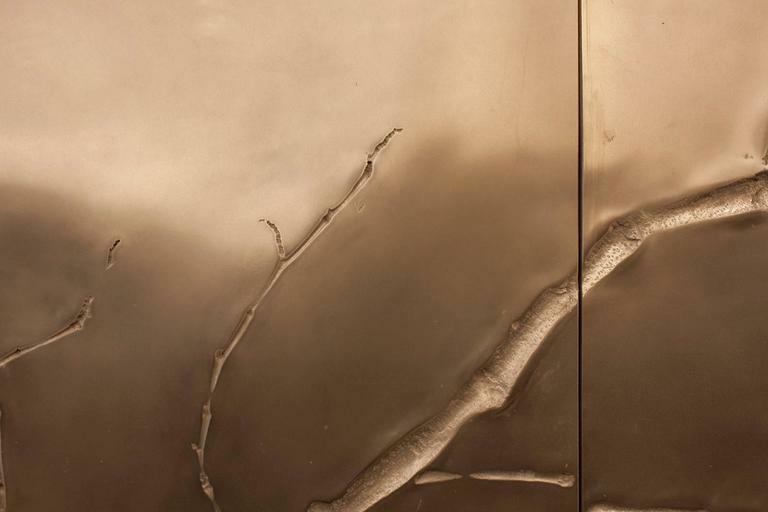 Of unparalleled stature and rarefied beauty is this bronze surface art which features the high texture of branches in relief against austere atmospherics of a polished undulating field. The countering natures in this Minimalist vocabulary create abstractions of movement, wind, while exploring contemporary ideas of planar surface representation in this artwork titled ‘Ghosted Branches I’. 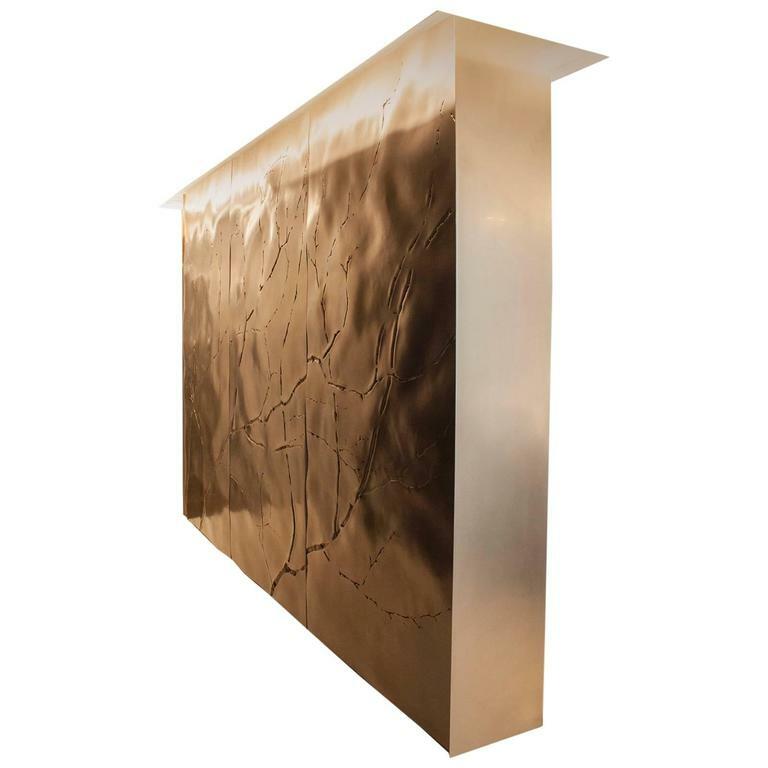 Made of polished bronze resin on MDF panel, it comes as a wall mountable sculptural surface panel installed by skilled contractor or by Ether Atelier. 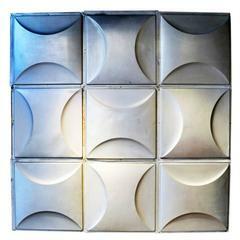 On offer is a sequence of three wall panels for a one-sided wall installation. Installation is not included in price but available upon request. 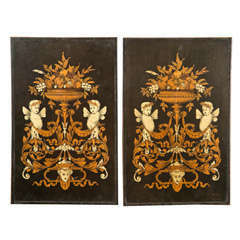 (Shown in photos is a two-sided wall installation with bronze plate end panels, which is not included in this offer unless requested by customer). Note the bronze finish is unlacquered and waxed for maximum beauty, which will age and tarnish naturally over time, requiring annual or bi-annual waxing maintenance. 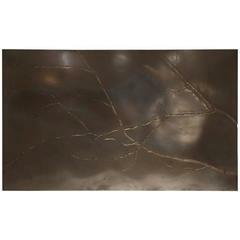 ‘Ghosted Branches I’ is currently in limited production and fully customizable in panel sizes to your project requirements as a complete wall panel finish or as a standalone unframed or framed artwork. Pricing can be obtained easily by contacting us and discussing your project. 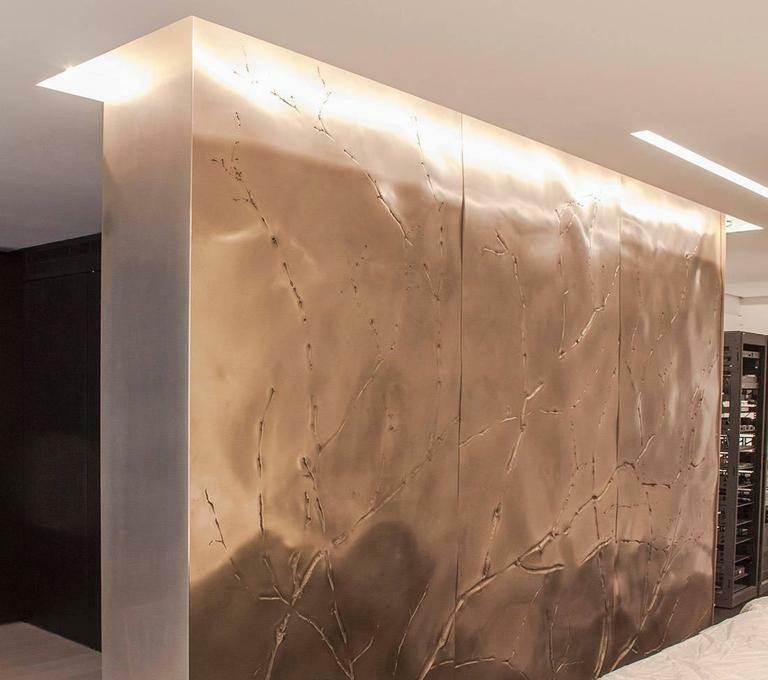 Designed and created by Michael Wong, whose work in surface design revisits the tradition of bronze reliefs, here, brings the medium to a contemporary stage of sculptural abstraction with respectable richness. His studio, Ether Atelier is a studio discipline whose vision to pursue raw material phenomena as a way to distill concepts that are visceral, tactile and sensual. We see, touch and exist with materials with a fundamental respect for their being. Reflecting a timeless contemporary vision combined with a dynamic artistic palette, we believe that people are inspired by the art making process and the artist’s connection to nature and oneself. Our workshop based in Brooklyn provides a place to research processes while making the finest products featuring exclusive processes and techniques. 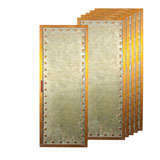 On offer is a sequence of 3 wall panels for a one-sided wall installation. Branch connectivity between panels not guaranteed. Installation is not included in price but available upon request. (Shown in photos is a 2-sided wall installation). 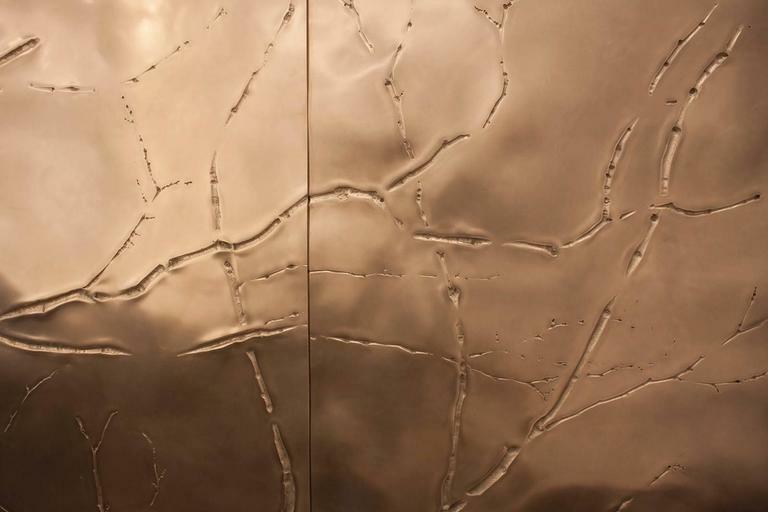 Designed and created by Michael Wong, whose work in surface design revisits the tradition of bronze reliefs, brings the medium to a contemporary stage of sculptural abstraction with a subtle and rarefied view of richness. His studio, ETHER ATELIER is a studio discipline whose vision to pursue raw material phenomena as a way to distill concepts that are visceral, tactile and sensual. 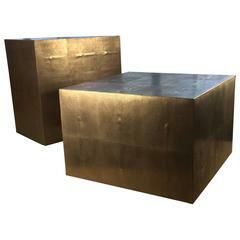 We see, touch and exist with materials with a fundamental respect for their being. 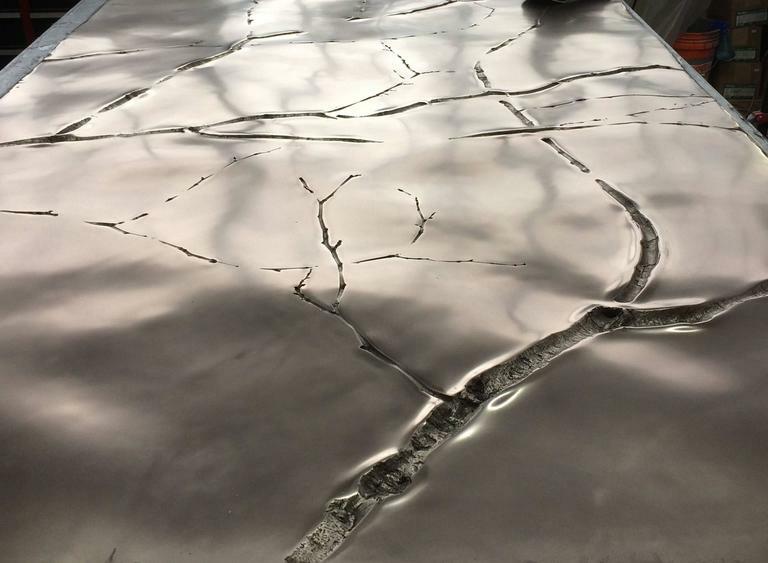 Reflecting a timeless contemporary vision combined with a dynamic artistic palette, we believe that people are inspired by the art making process and the artist’s connection to nature and oneself. Our workshop based in Brooklyn provides a place to research processes while making the finest products featuring exclusive processes and techniques. Impressive palace panel from India, circa 1900. It is made up of two pieces and is made from teakwood. 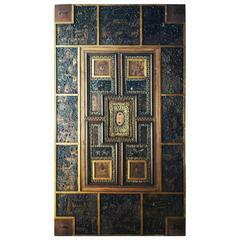 Five wood framed metal studded panels from France. 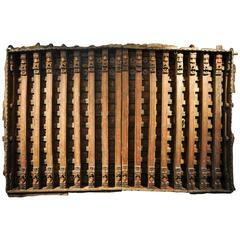 A grand eight panel Coromandel screen. The screen has mostly a gilt background with a few architectural structures and figures. A very good looking screen.